Indonesian celebrity Fitri Tropica and former JKT48 member Haruka Nakagawa are on a mission to visit Tohoku and learn more about this region on a special TV show called Streets to Tohoku and Hokkaido, Japan. One of the themes of this program is traditional Japanese crafts, so let's take a look at some products that make the region special. With origins in Yamagata over 900 years ago during the Kohei Period (1058-1065), Yoriyoshi Minamoto got an order to conquer Oushu, an old part of Yamagata. During the battle, one of the warriors (who happened to be a caster) found that the sand along Mamigasaki River and the soil at Chitose Park were perfect for casting; so he decided to stay there. Yamagata casting was produced locally and used as a daily commodity as well as a Buddhist altar item. Worshipers from all over Japan bought the casting products as souvenirs. That's how Yamagata's casting spread to many places around Japan. As casting techniques progressed, more products and larger items were made, such as the large bells seen at temples. After the Yamagata Prefectural Office was established in 1876, the prefecture recognized that Yamagata's castings were among the best in Japan and helped to promote these products. In 1974, a law for the promotion of traditional industrial arts was passed and Yamagata's casting was designed as a primary product, one produced with traditional skill and technique. 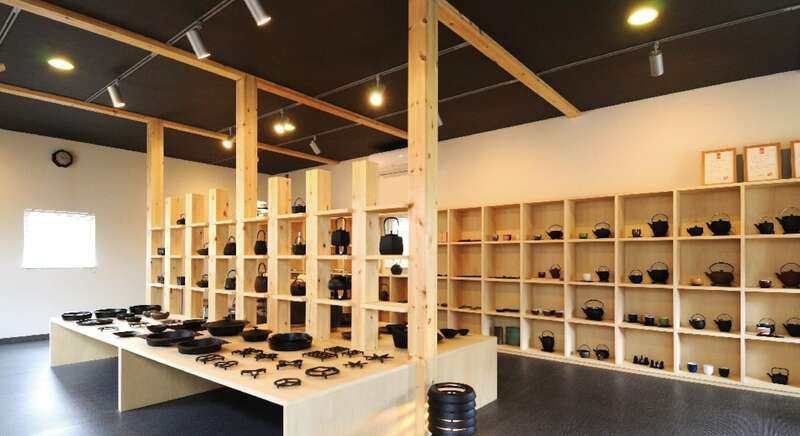 Chushin Kobo, a traditional iron casting workshop, proposes items that fit the modern lifestyle. As there are a number of craft techniques built around tea ceremony, this company strives to combine those old-school items with new designs, creating a new lifestyle tool. The workshop was founded in 1997, aiming to produce and distribute items designed by Hisanori Masuda. A stunning example is this Natsume teapot, made using Japanese traditional cast iron techniques. It has a very elegant tall, slim design that sets it apart from the usually rounded shapes, and is available in two sizes. The design of this teapot has been inspired by the shape of helmets worn by Japanese samurai called kabuto. Made of cast iron, these teapots were produced in the city of Takaoka, a center of metal casting in Japan with hundreds of years of history. The inside is coated with silicone to prevent rusting. The coating is resistant to moderate heat so the teapot can be placed on a candle or on a gas stove at medium heat. The silicone coating is permeable, meaning it doesn't prevent iron consumption for those needing the dietary supplement. 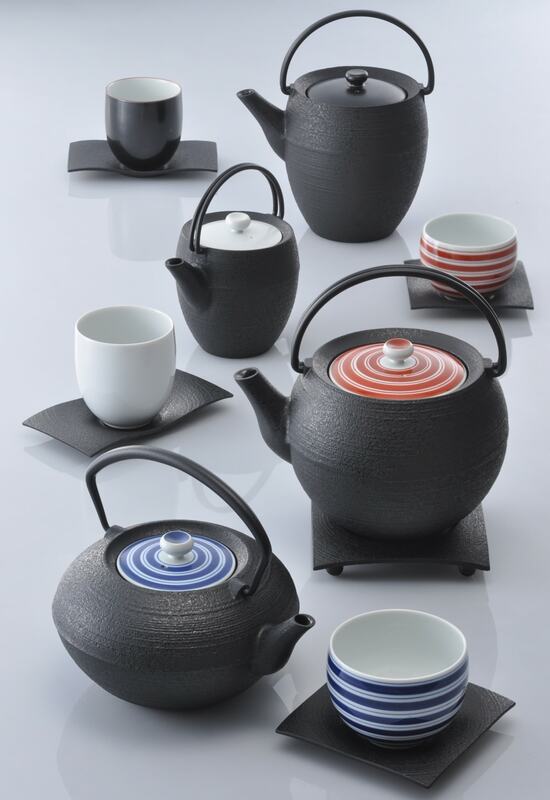 The Shaen teapot is a perfect mix of traditional and modern Japan. While it's produced using traditional cast iron techniques, its asymmetric design is very modern. The overall simple shape without any decoration emphasizes the beauty of the asymmetric design of the pot. This cast iron windchime on a cast iron stand has a beautiful and modern design. The bottom of the stand can also serve to hold small objects, such as keys or coins. Maru means round in Japanese. Similiar to the Maru design above is the Sankaku windchime. Sankaku means triangle, and this cylindrical cast iron windchime is quite stunning in all its various colors. This Odate bentwood set, consisting of a sake pot and five sake cups, is the perfect gift for any sake lover. The cups are a combination of Japanese traditional craft techniques and contemporary design. The beauty of the sake pot comes from the simplicity of its design, the natural grain of the cedar wood and the dark cherry bark used to fix the ends of the bentwood sheets to each other. The pot is very elegant and very easy to use when pouring sake into the cups. Odate bentwood items are made from Japanese cedar cut into very thin slices. The wood is cooked in boiling water until it becomes flexible so that it can be bent into various shapes. The end pieces of the bentwood are fixed together with dark cherry bark, which not only makes a nice dark accent on the light wood but also creates a durable and natural bond. These bentwood cups are made even more beautiful by adding a colored wood ring to the simple design of each cup. The ring adds a pop of color to each cup and it allows each family member to have their own cup. In this program, Fitri Tropica and Haruka Nakagawa take trips to places of interest, taste typical Tohoku and Hokkaido cuisine and shop for unique items. Watch for experiences that can only be had in Tohoku and Hokkaido! Don't miss it every Saturday at 9 a.m.